Sin Tech is a technologically advanced small company covering areas of the South West, Devon and Dorset. They specialise in mobile troubleshooting and fault finding of problems associated with modern vehicles and their complex on board systems. 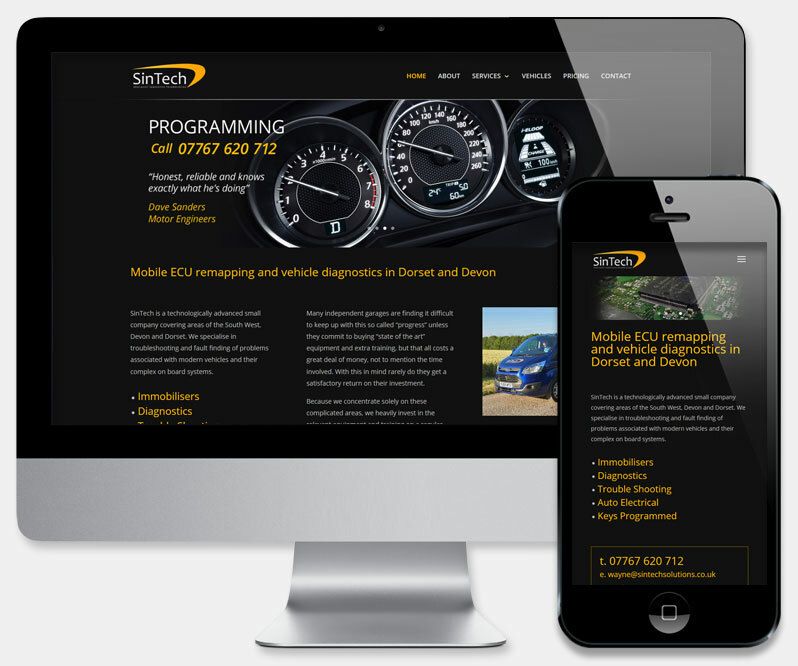 We were commisioned to create a responsive website for Sin Tech's mobile vehicle remapping, electrical fault finding and programming business. It was essential that the new site be easy to navigate and that it showcase all of Sin Tech's available services on any device. An additional requirement was to detail all data relating to the vechicle remapping service, providing graph data and tables for various remaps and vehicle types. Based on the latest responsive WordPress CMS, the new site provides detailed service information, contact details, location map and news board. We contacted the remapping software supplier directly, to aquire a suitable API for vehilce data. This allows visitors to search for all available remap information without leaving the Sin Tech site. Finally, a training session on the use of the CMS ensured that the client is able to maintain their site in the future. My first website in 6 years of trading partly because the whole process scared me. Dee and the rest of the staff at Website Developments put me at ease straight away and made the entire experience so easy to the point I wish I had done it much earlier. Great communication throughout and extremely professional. The site looks great and is totally expandable and easy to update by myself. A great job and I won't hesitate in recommending them to anyone. Good job guys, well done and thank you.